Civil Rights Memorial | THERMO Spoken Here! This memor­ial in Montgomery, Alabama was designed by Maya Lin to honor the Civil Rights movement and some 40 persons who were murdered because they believed in equal rights for all. The names of those killed are engraved, aligned radially, around the circular edge of a massive, flat, granite stone. Water (pumped from below) rises steadily near the center of the stone, wells upward with speed, then spreads and calms as it flows outward to pass over the names of the dead. The water then wraps, without a ripple, over the rounded edge in a circular waterfall. On a school-trip, some students sketched the monument while others judged characteristics of the water flow. With a stick, they measures depths of the flow at places around the annular edge of the stone. To estimate flow velocity at the edge, two students dropped tiny pieces of a leaves onto the water and counted as they moved. They judged the speed of water flow at the perimeter at a number of places. Their data are presented in the sketch. Calculate the approximate volume rate of water across the monument. ♦ The water of our system resembles a thin disc. Near the center of the disc water enters being pumped from below. 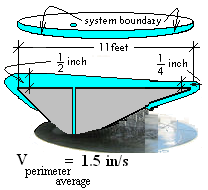 About the perimeter of the disc, the water forms a circular waterfall. The exiting area is annular, with heights that measure 1/2 inch maximum down to the least height - 1/4 inch. The system will be the mass of water at any instant "on the stone." That mass is constant. Water enters the system steadily,flows uninterrupted over the stone and off of it or out of the system. We assume the average velocity of the water around the annulus to be 1.5 in/s. The area is symmetric - we will calculate one half the flow then double that number. One half the perimeter, P, equals the radius times pi; 5.5 π feet. The average height, H, of the exiting flow is [(1/2in + 1/4 in)/2] or 3/8 inch. With this information, the supply volume rate is calculated. Does this number seems large? Check the numbers. Why is it so large?